The Space Shuttle Atlantis returns after mission STS-30, landing at Edwards Air Force Base on May 8, 1989. 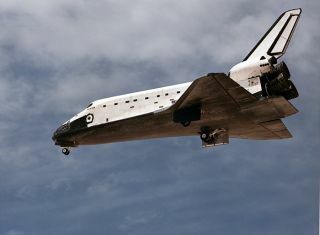 In this historical photo from the U.S. space agency, the Space Shuttle Atlantis returns to Earth after mission STS-30 landing at Edwards Air Force Base, CA. at 3:43:38 EDT on May 8, 1989. The orbiter Atlantis was launched form Kennedy Space Center May 4, 1989 at 2:46:59 p.m. EDT carrying into low Earth orbit the spacecraft Magellan. It was Atlantis' fourth shuttle mission. Approximately six hours after launch, Magellan was deployed from the Atlantis payload bay beginning its 15 month long journey to the planet Venus. Crew members of STS-30 were: Commander David M. Walker; Pilot Ronald J. Grabe; and Mission Specialists Mark C. Lee, Norman E. Thagard, and Mary L. Cleave.